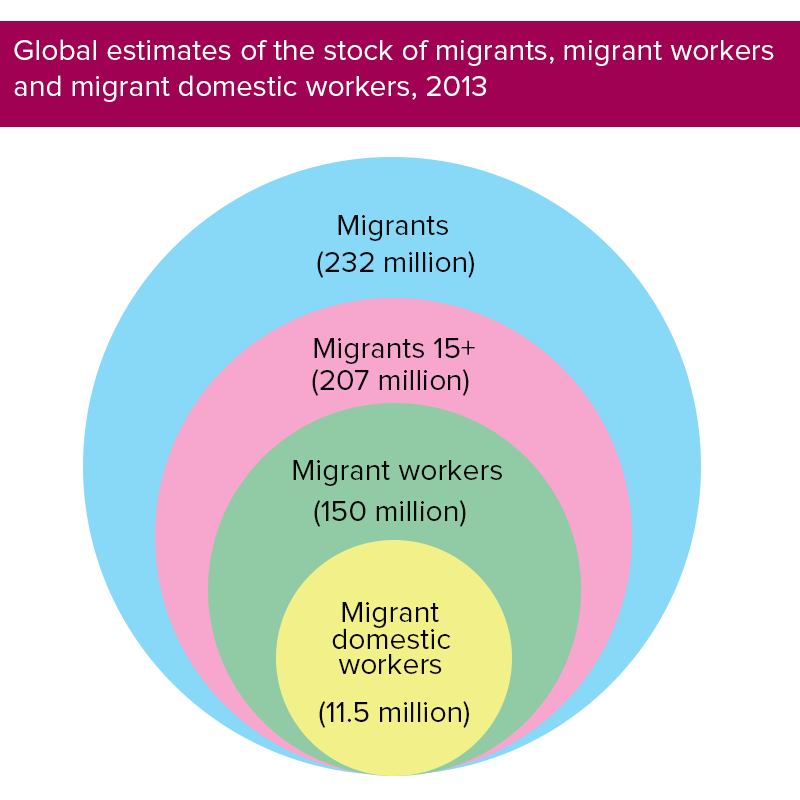 The UN Global Compact and labor migration: What can we expect? The Global Compact on Migration (GCM) is an agreement that is being negotiated through the United Nations (UN) by its Member States to establish a new regime for cooperation on international migration. One of the major goals of the GCM is to expand labor migration and labor mobility channels for migrants seeking work in countries other than their own. But what could that look like in practice? There are approximately 244 million international migrants around the globe, accounting for approximately 3 percent of the world’s population. The UN’s International Labour Organization (ILO) estimated that 150 million or two-thirds of all international migrants were in the labor forces of the countries to which they moved in 2013, suggesting that many, if not most, migrants cross national borders for economic reasons. Migrants are also more likely to be employed than natives of the countries to which they moved. The ILO estimated that 73 percent of migrants aged 15 and older were employed or seeking jobs, compared with 64 percent of non-migrants. Both male and female migrants have higher labor force participation rates than non-migrants, 78 percent for migrant men compared to 77 percent for native-born men and 67 percent for migrant women compared to 51 percent for native-born women. 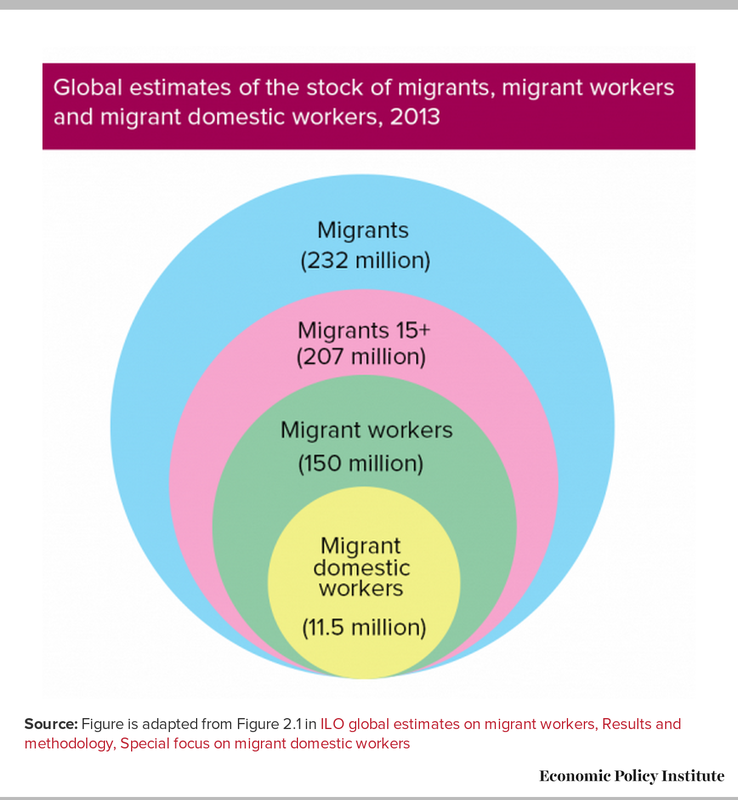 A third of migrant workers were in Europe, a quarter in North America, and most of the rest in Asia; three-fourths were in what the ILO considers to be high-income countries. More than 70 percent of migrant workers were employed in services (including domestic work), 18 percent in industry (defined as goods-producing such as construction and manufacturing), and 11 percent in agriculture. About 8 percent of international migrant workers, some 11.5 million, were domestic workers employed in private homes. The United States hosts by far the largest number of international migrants: 46.6 million in 2015, nearly one-fifth of the world’s migrants. Overall in 2016, migrants (defined as “foreign-born” in U.S. Labor Department data) were more likely to work than the native born: migrants had a labor force participation rate of 65.2 percent, nearly three percent higher than the participation rate for the native-born (62.3 percent). Migrants make up about 17 percent of the total U.S. workforce; less than Australia, Canada, and Switzerland, which have higher shares of migrants in their labor forces. Migrant workers enter the U.S. labor market through a variety of pathways. They may arrive through the formal labor migration programs with jobs in hand, either as permanent immigrants or temporary guestworkers, or initially as humanitarian migrants or for family reunification purposes, and later become employed. About 5 percent of migrants in the U.S. workforce are in an irregular status; having either entered the country without authorization or after initially entering with an authorized status that later expired. What will labor migration look like in the GCM? Fair and well-managed migration is good for the economy, and can increase earnings for migrants as well as native-born workers. The UN Member States crafting the GCM must figure out how to achieve this; they are likely to consider two prominent points of view about how to improve the governance of international labor migration and attain its economic benefits. First, there are those who argue that many more workers should be allowed to move across borders freely because increasing labor migration results in higher wages for individual migrant workers, jobs filled in destination countries, and remittances flowing to countries of origin that spur development. They urge richer countries to open their doors wider to workers from poorer countries. To reassure governments that migrants will depart after a season or a set number of years of work, those who equate more migration with more development suggest expanding temporary and circular migration schemes and programs—also known as guestworker programs. Many of those advocating for freer movement, however, are unfortunately willing to accept discrimination against migrants in order to boost their employment, by supporting rules in guestworker programs that allow employers to pay lower wages to migrants than native-born workers and prohibit migrants from receiving access to employment benefits. They know that higher labor costs for employers can mean fewer migrants will be hired, and their goal is to maximize the number of jobs for migrant workers. This week’s Economist offers an example of this in an article calling for increasing free movement for migrant workers (and citing the research of Michael Clemens at the Center for Global development and Bryan Caplan and Vipul Naik). The Economist notes that curtailing the rights of migrant workers and charging them fees and extra taxes while restricting their access to welfare benefits would be “horribly discriminatory,” but somehow still argue it’s acceptable because economic gains will result, and in any case, “no one is forcing” migrant workers to move. The article goes on to cite the Gulf region as an example: “Today, millions of migrants work in the Gulf, where they have no political rights at all. Despite this, they keep coming.” In our minds, The Economist’s support for a system that enshrines discrimination and even forbids migrants from having any rights in countries of destination—which workers often accept because they are desperate to escape dire economic conditions—is misguided and inconsistent with basic human rights standards. The other major camp in this debate is represented by those who argue that migrant workers must be treated equally in order to have safe, regular, and orderly migration. This rationale is based in part on the ILO conventions developed through the UN to protect migrant workers in the aftermath of World War II, when millions of workers were forced to move across borders. The crux of this argument is that when recruiters charge migrants for jobs (a common practice today), and employers are permitted to pay migrants less or provide them with fewer benefits than native-born workers, migrants become vulnerable to exploitation and even human trafficking. These situations should be avoided; the bedrock principles at play here are equal treatment and non-discrimination. Protecting the rights of migrant workers is both the right thing to do and the best way to protect native-born workers from unfair competition with exploitable and underpaid migrants. The optimum scenario from our perspective is for countries of destination to admit migrant workers when they are needed in the labor market, but ensure that both migrant and native-born workers are protected and treated equally when it comes to wages, benefits, and human rights. Legalizing discrimination against migrant workers—as many guestworker programs do—so that employers prefer to hire them legitimizes a race to the bottom, accruing benefits to those willing to take advantage of migrants. The UN’s Global Compact on Migration in 2018 should not give governments an excuse to discriminate against migrant workers—but it might. This is, in essence, what occurred during the now-stalled negotiations for the World Trade Organization’s General Agreement on Trade in Services, where some governments argued that migrant workers should not be subject to laws in destination countries relating to minimum wages and work-related benefits because they were only temporarily working abroad as service providers (and thus not bona fide participants in local labor markets). Governments negotiating the GCM are aware that public opinion in many countries may oppose the admission of more migrant workers in an era when workers around the globe feel understandably insecure about their jobs and futures. Governments may well be tempted to respond to domestic and global pressures—from developing countries and well-meaning advocates, but also from business interests and corporate lobby groups—to admit more migrants by creating new or expanding existing guestworker programs that include laws and regulations curtailing the rights of migrant workers. The Global Compact on Migration should avoid such steps and instead reinforce the half-century long quest to ensure equal rights for all workers, regardless of their country of origin.